Another late start to throwbacks week. The past week and last week has been a bit trying to for me. I've been feeling down and I have that awful sneaking suspicion things are not going to get any easier soon. This does tend to impede on my blogging, but I'm trying to pull through! I actually have a new to me polish and brand to share with you today. The brand isn't new, nor is the polish though, and as it's over 2 years old it does classify as a throwback in my book! I received some of my first Pretty Serious Cosmetics polishes a few weeks ago during a Halloween gift exchange. I was really excisted as this brand has been on my wishlist and "to do" list for a very long time. I just never got around to getting any. This color is pretty spectacular! 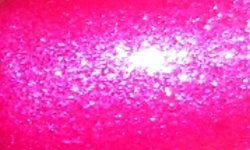 The Pink One is a hot pink with an intense blue flash shimmer. Color: This is a bright pink, it's not neon, but it's definitely bright. I love bright pinks like this, but what makes it even better is that awesome shimmer with that blue flash. This color is really eye catching and beautiful. Love it! Formula: Excellent formula. I used 2 coats above. I didn't have any trouble with application. Price: This is $7.79 US Dollars on Pretty Serious' website. Overall: Gorgeous polish. This is the type of color I consider a staple in every nail polish collection. I think everyone needs a color like The Pink One. This is a type of color that never goes out of style and is flattering on many.